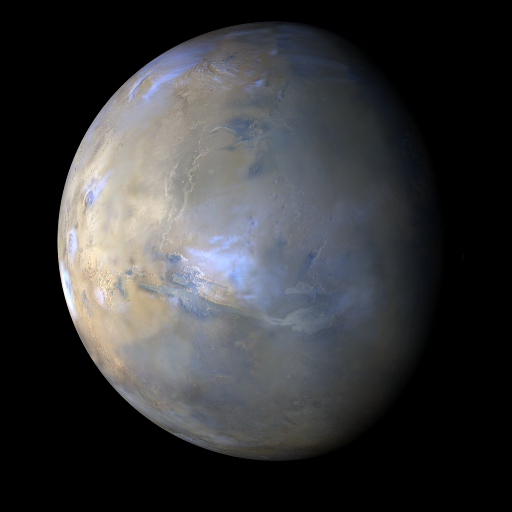 Last week on Mars, weather patterns were fairly typical for this time of martian year. A large dust storm was observed over Cimmeria and Sirenum at the beginning of the week. In the following sols, the dust lifting quickly abated but a residual dust haze was observed spreading eastward over Aonia. Looking to the northern plains, a number of dust storm and water-ice clouds were spotted propagating east from Arcadia to Utopia. Dust lifting along the equatorial latitudes was rather uneventful apart from a tiny spiral storm near the caldera of Pavonis Mons at the start of the week. For most afternoons, condensate water-ice clouds continued to linger over Tempe landforms, Tharsis Montes slopes, and plateaus near Valles Marineris. Both rovers, Opportunity in Endeavour Crater and Curiosity in Gale Crater explored under storm-free conditions throughout the week. Malin, M. C., B. A. Cantor, A. W. Britton (2018), MRO MARCI Weather Report for the week of 14 May 2018 – 20 May 2018, Malin Space Science Systems Captioned Image Release, MSSS-531, http://www.msss.com/msss_images/2018/05/23/.